At last - for the first time - there is a book devoted exclusively to the subject of winning, or winning back, love. 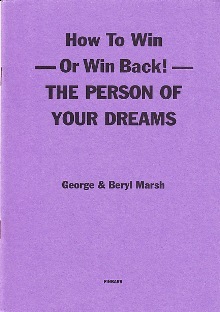 This book "How To Win - Or win Back - The Person Of Your Dreams", an exclusive from Finbarr's, is the result of 15 years of experience and research by two proficient marriage counsellors who are also master occultists! George and Beryl Marsh know the secrets of successfully catching the person of one's dreams. These secrets have been partially covered in other books, but this book gives the story in full and it's sole purpose is to get love into the reader's life, in very real and definite terms! * HOW TO METALLY SEDUCE THE PERSON OF YOUR DREAMS! * MASTERFUL, BUT EXTREMELY SIMPLE, OCCULT TECHNIQUES THAT COMPEL THE PERSON OF YOUR DREAMS TO COME TO YOU! * HOW TO DEVELOP IRRESISTIBLE POWERS OF CHARM AND MAGNETISM! * POTENT TECHNIQUES THAT PREVENT ANYONE FROM STEALING YOUR LOVED ONE AWAY FROM YOU! * HOW TO IRRESISTIBLY COMPEL A STRAYING PARTNER TO RETURN! * HOW TO ENSURE THAT HE OR SHE NEVER STRAYS AGAIN! * HOW TO INSPIRE TOTAL DEVOTION AND LOYALTY IN YOUR LOVED ONE! ...and more in this remarkable 'get love and keep it' book. Buy this book and practise its simple techniques, say the authors, and you will never want for love or admiration again!